The NFL offseason is too long, especially if your team is sitting on the first overall draft pick. The months between the final game of the year and draft day gives fans way too much time to think about how to fix their respective team. A perfect example of this is the fact some, including left tackle Joe Thomas, apparently believe the Cleveland Browns shouldn’t put as much focus into drafting a quarterback in April. Instead, they should just give DeShone Kizer another shot. After all, he’s only played one season, why give up on him this early? I certainly understand the thinking, but I couldn’t disagree with the sentiment more. I believe the damage done to Kizer last year will have lasting effects, making the idea of just sticking with him and not drafting a QB way too risky. To be fair, the reasons to give Kizer another chance make sense on paper. At just 22 years of age, it’s too early to call him a bust. The year-over-year turnaround we saw from Los Angeles Rams quarterback Jared Goff sure seems to prove a player can overcome a rough rookie season. With a year of NFL experience under his belt, you could assume Kizer has learned a lot about life in the pros. Well, everything except how to win a football game. Honestly, as alarming as it would be going into next season with Kizer at the helm despite his not knowing what it takes to pull off a victory, this isn’t the driving factor in why I believe the team needs to find another solution. Instead, I’m more concerned with how much damage he went through last year and, more importantly, if he’s able to recover from it. Thanks to being managed in brutally inept fashion by coach Hue Jackson, Kizer was a shell of a human being by the time last season wrapped up. His teammates openly noted his confidence was shot, as if what we were seeing on the field wasn’t enough proof of this. Kizer continually forced awful throws in attempt to make something, anything productive happen. Instead of cashing in, the result was often a turnover. To be frank, it’s amazing Kizer still even wants to play the sport of football after what Jackson did to him last year. Despite the fact every pre-draft write-up you could find on the former Notre Dame standout claimed he was raw and not ready to start right away, the Browns refused to bring in a proven veteran to hold the fort until he was ready. Instead, Kizer was thrown to the wolves in Week 1 despite not truly winning the starting job. Throughout the season, Jackson continuously implied he was sticking with Kizer through thick and thin. Between making these claims, he was also yanking his young quarterback mid-game, sometimes at the slightest sign of trouble. By December, Jackson was telling the media it was fair to wonder if Kizer (again, in the first year of his career) will ever get it. Tell me a quarterback who spent the past season enduring a crash-course in how to ruin a career is someone you’d feel comfortable relying on coming into this year. Explain to me how a front office can watch all of this go down and still determine Kizer is dependable enough to build around. All due respect to the young QB, but Cleveland must find another option at this position this season. Whether it be through the draft, finding a vet in free agency, or both, the Browns simply can’t afford to run it back with the same depth chart as last year. Maybe if the Browns had handled Kizer differently, if they had brought in a serviceable veteran last offseason (i.e. not Brock Osweiler), things wouldn’t be this bleak. Maybe if Cleveland would’ve parted with the historically terrible coach who spent last season destroying Kizer mentally and emotionally, there’d be hope for a bounce-back season. However, none of this happened. 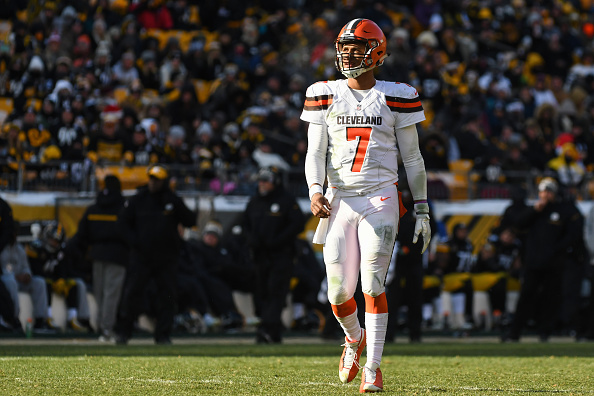 The Browns set Kizer up to fail, and he did just that. There remains a chance some of the damage done was permanent, which wouldn’t be the least bit surprising. As a result, passing up the chance to draft another quarterback is something Cleveland can’t do. This is a franchise which has struggled to find a solution at this position for two decades now. It can ill-afford another misstep, which is exactly what relying solely on Kizer turning it around would be.